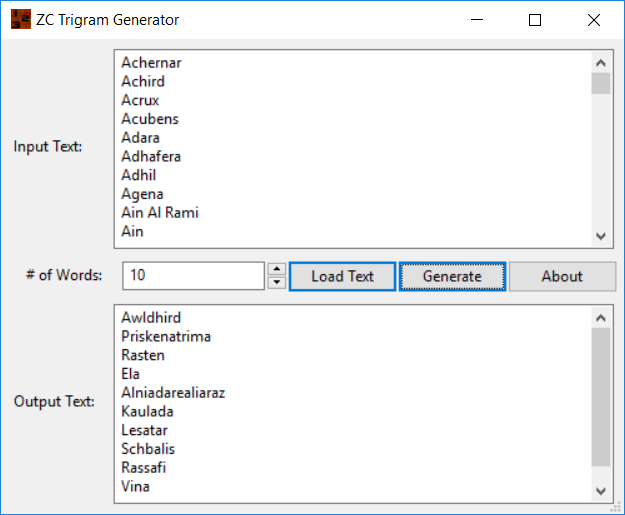 A long time ago I wrote a free Windows app called the “ZC Trigram Generator”. It was a simple app to generate plausible-sounding words based on a set of input words. It had a steady trickle of downloads for around 8 years or so, about 1500 downloads per year. Two years ago I open-sourced it and posted it on GitHub. Today I updated it to be a little easier to use by adding a “load text” button to load a text file. It works on Linux and Windows 7 or newer (including Windows 10). It’s available here on GitHub if you’d like to get it.